Hyperconverged Infrastructure is supposed to simplify the data center by creating an environment that automatically scales as new applications and workloads are added to it. The problem is that the current generation of HCI solutions can only address specific use cases like virtual desktops or tier 2 applications. First generation HCI solutions don’t have the per node power to accommodate enterprise workloads and tier 1 applications. The organization needs a next generation HCI solution, HCI 2.0, that can address HCI 1.0 shortcomings and fulfill the original promises of HCI; Lower costs, faster innovation, simpler scale, single vendor and unified management. 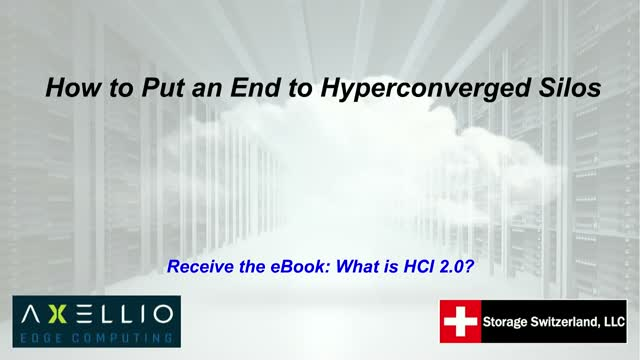 The combination enables HCI 2.0 to handle a variety of storage intensive workloads. Presented by: Storage Switzerland, Axellio Inc.